ConceptDraw DIAGRAM enhanced with Flowcharts Solution from the "Diagrams" Area of ConceptDraw Solution Park is a powerful Processing Flow Chart software which will help save lots of your time. Flowcharts Solution is so helpful thanks to the powerful drawing tools and set of libraries with numerous ready-to-use vector objects developed specially for ConceptDraw DIAGRAM users. Large collection of predesigned samples included in Flowcharts Solution deserves special attention. It is conveniently represented in ConceptDraw STORE. 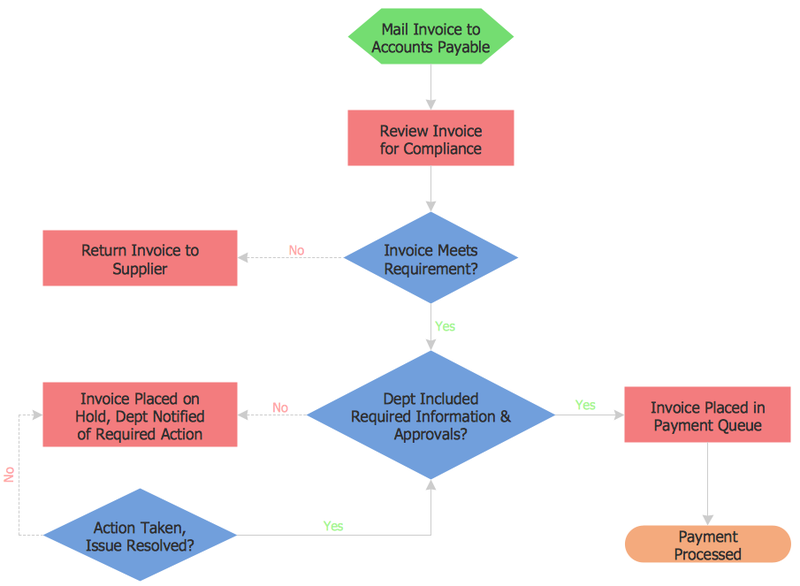 Each Processing Flow Chart sample included in Flowcharts solution for ConceptDraw DIAGRAM is carefully thought-out example, perfect base for drawing your own process flow chart diagram and excellent source of inspiration! assists to improve teamwork effectiveness. Usually a flowchart has sufficiently great size, for ConceptDraw DIAGRAM it's not a problem. Now, you don't need to think about flowchart size, you can design arbitrarily large flowchart. If your chart does not fit the document size, if it is bigger than document, use the Fit to Content tool to automatically resize page according to the size of flowchart on it. Don't forget to add comments and additional information near the chart, they allow to make your flowcharts more informative and useful. The samples you see on this page were created in ConceptDraw DIAGRAM software using the predesigned shapes from the libraries of Flowcharts Solution. These samples successfully demonstrate solution's capabilities and professional results you can achieve. An experienced user spent 10 minutes creating every of them. Use the tools of Flowcharts Solution for effective Processing Flow Chart design and easy creating professional looking Flow Process Charts. All source documents are vector graphic documents. They are available for reviewing, modifying, or converting to a variety of formats (PDF file, MS PowerPoint, MS Visio, and many other graphic formats) from the ConceptDraw STORE. 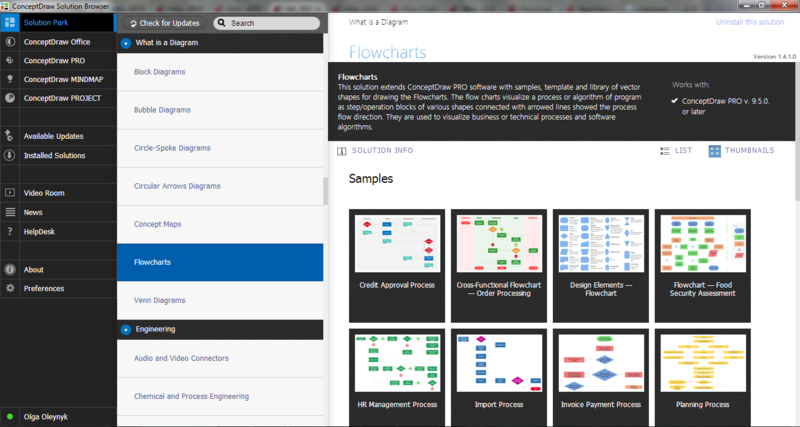 The Flowcharts Solution is available for all ConceptDraw DIAGRAM or later users. This sample was created in ConceptDraw DIAGRAM v12 diagramming and vector drawing software using the Flowcharts solution from the What is a Diagram area of ConceptDraw Solution Park. This sample shows the Flowchart of the Credit Card Order Process. On this diagram are used the flowchart symbols that represents the processes and documents. The flowchart symbols are connected with arrows. It is so simple making the drawing process easier and faster. you just need to choose the right drawing software. ConceptDraw Arrows10 Technology - This is so easy and fast to draw any type of diagram with any degree of complexity.